Suddenly, your heart beat stops...and it appears that the blood vessels have ruptured! This incidence is regarded as the second most common heart disease in the world. Patients experiencing this condition described it as like some kind of monsters is biting the heart from their body. What's happening? Look at the illustration below. By looking at the illustration above, the yellow-colored area is made up of fatty deposits covering the heart. In particular, we understood that the heart problem was caused by these fatty deposits closely covering the heart. Why am I getting sharp pain and stabbing sensation in my heart? The coronary arteries, which are located along the surface of the heart, are blood vessels that supply blood and oxygen to the heart muscles. When fatty deposits occur, these arteries become clogged and the heart won't be able to get enough blood and oxygen. This will cause a sharp pain in the heart and is the first stage of atherosclerosis. If blood clot forms, then heart attack may occur as they are blocking the blood flow in the arteries. Another thing is that broken arteries have high numbers of macrophages (a type of white blood cells). Repeated injuries to the artery will only attract more macrophages. At this point, the wall of the artery becomes thicker, which can aggressively promote blood clotting. Too much cholesterol in the blood, damage to the artery wall, and inflammation, are some of the causes of fatty plaque buildup. Fatty heart is more likely to occur among obese or overweight people. If you eat more calories than you expend, the extra calories will be stored as fat cells, which will be the storage bin for excess calories. To prevent coronary artery disease, atherosclerosis, and heart attack, try losing weight by at least more than 10%. The best way to achieve this is of course through diet. Also, by doing more exercise, walking, and getting a good night's sleep every day, you can get rid of fatty deposits around your heart in just three weeks. If you take good care of your heart and the rest of your body, and by using the PYRO-ENERGEN therapy to avoid contracting diseases, you will certainly be able to live a healthy and longer life. Interesting Heart Trivia – DID YOU KNOW? Your heart beats about 35 million times every year. That roughly translates to 100,000 beats per day, 70 beats per minute, and 2.5 billion heartbeats over the course of a lifetime. Each beat of your heart can have enough strength to shoot blood at a distance of up to 30 feet. In a lifetime, 1 million barrels worth of blood is pumped through the heart on average. Your heart is almost made up entirely of muscle. It's incredibly strong that it can lift a 3,000 pound object (about the weight of a compact car). 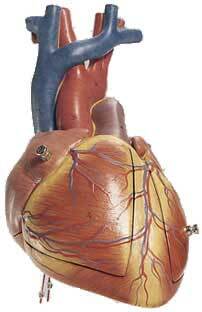 Your heart is feeding 60,000 miles long of blood vessels. That's more than twice the circumference of the earth! 5. "Heart Disease Risk Increases at Age 40 and on Menopausal Women"